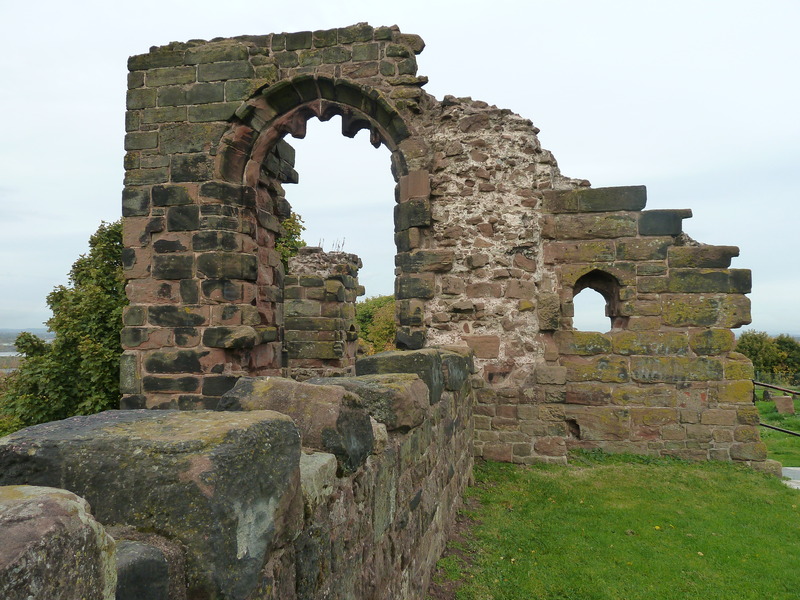 If you have read The de Lacy Inheritance you will know that it begins at Halton Castle in Cheshire as Richard is read the Mass of Separation. I visited the castle when I was researching the novel but didn’t write about its history at that time, so when I made another visit at the weekend I decided it was time for some photos and a bit more information. 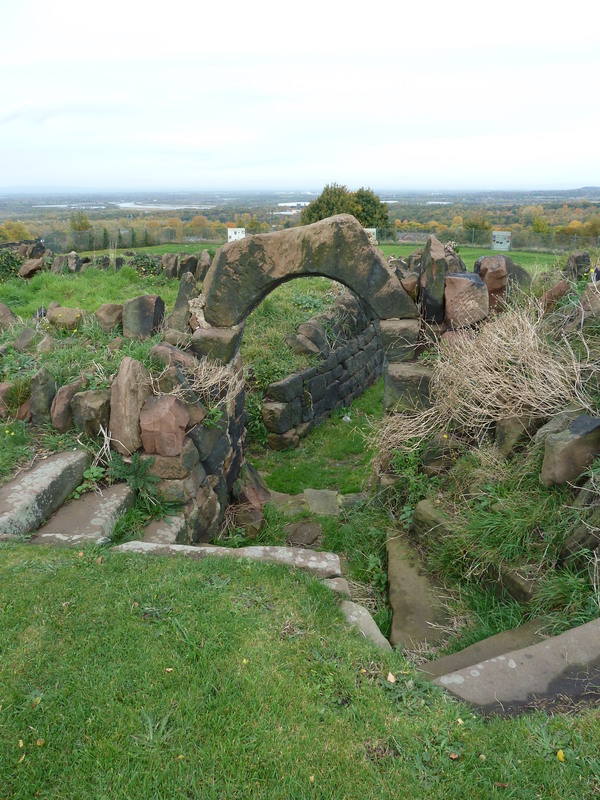 The remains of Halton Castle. The hill where Halton Castle is sited must have been a defensive position long before the Norman Invasion. The view is amazing, even on a fairly dismal day, and I must try to visit again when the weather is clear and remember to take my binoculars with me. You can see across the river Mersey to Lancashire, to the distant mountains of north Wales, across the Pennines to Yorkshire, to Derbyshire and of course swathes of Cheshire. So, it isn’t surprising that it was on this sandstone outcrop that Nigel of Cotentin, the first Baron of Halton, built his Norman stronghold. 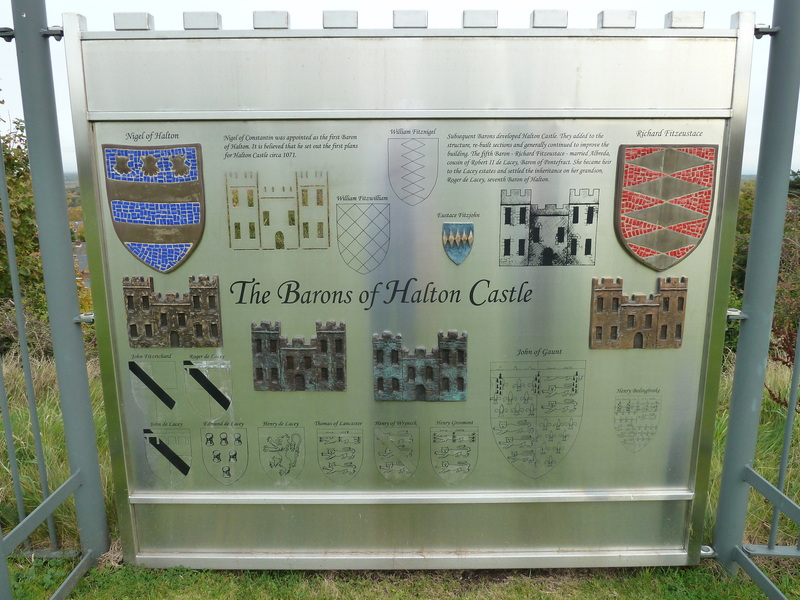 The Barons of Halton Castle. Looking out over the Mersey towards Stanlow. The castle controlled a strategic river crossing. 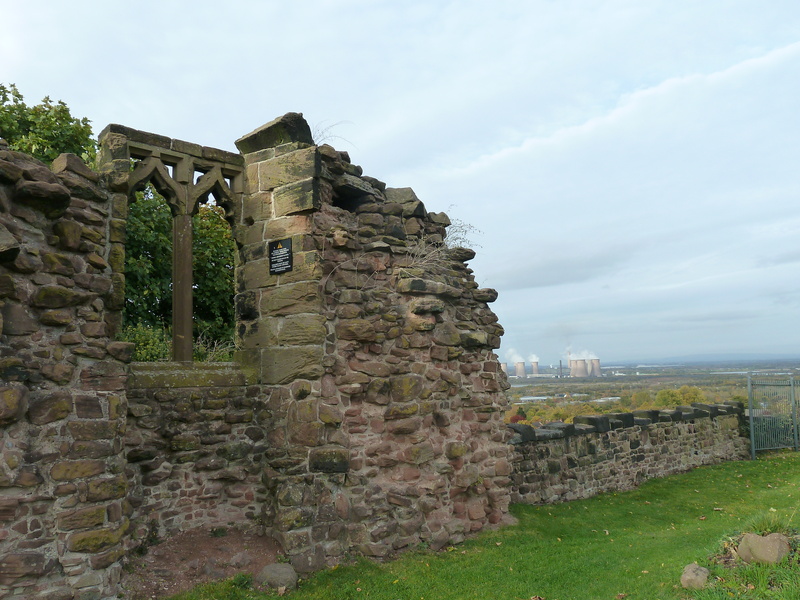 It was Nigel’s son, William FitzNigel,the second Baron of Halton, founded an Augustinian Priory in 1115 at Runcorn. This religious house was moved by his son, William FitzWilliam, to Norton in 1134. The castle and the priory are still linked today under the care of The Norton Priory Museum Trust, although after a varied history the castle is now part of the Duchy of Lancaster. Those familiar with the story of The de Lacy Inheritance will know that Albreda de Lacy, the cousin of Robert de Lacy (2) was the wife of Richard FitzEustace, the fifth Baron of Halton and she bequeathed her share of the de Lacy estates to her grandson Roger who took the name de Lacy. He became the seventh Baron of Halton and from that time the castle remained in the ownership of the de Lacy family until it was surrendered to King Edward II on the execution of Thomas, Earl of Lancaster who had married Alicia de Lacy. You can read more about that story in Favoured Beyond Fortune. The castle may have lost some of its importance after it came into the possession of the de Lacy family. They had bigger and better castles, such as Pontefract, and probably didn’t spend much time living at Halton, although it would have been an important administrative base. There was a visit from King John in 1207 and he gave £5 towards the upkeep of the chapel. By 1362, John of Gaunt was using the castle as a hunting lodge and between 1450 and 1457 a new gatehouse was built at a cost of £347. A survey from 1476 mentions a number of buildings at the castle, including a great chamber, a withdrawing room, a chapel, a hall and domestic buildings including a stable. During the English Civil War, the castle was a royalist stronghold in the charge of Earl Rivers, who was Steward of Halton. The priory, which had passed into private ownership following the Dissolution, was owned by the Brooke family who were parliamentarians. There were two sieges of the castle and it was eventually taken by Cromwell’s men. 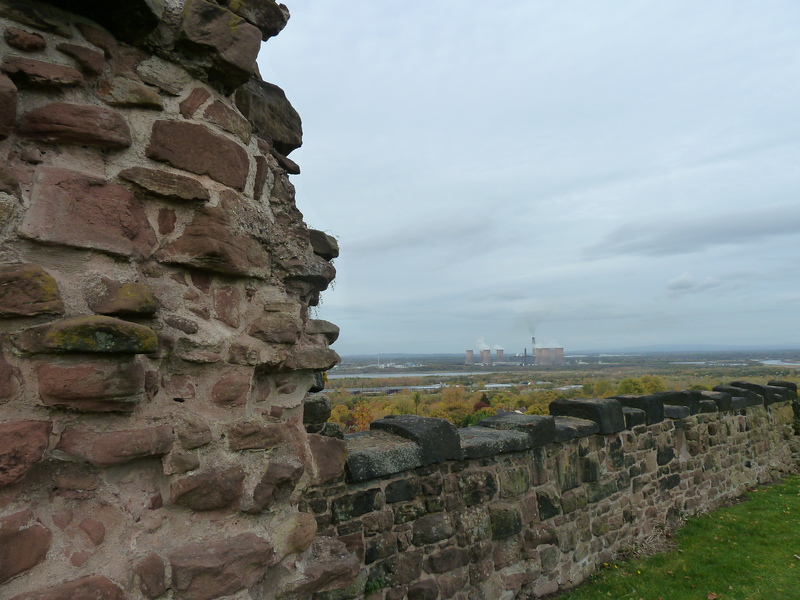 Much of the castle was deliberately ruined at this time to prevent its future use by the royalist supporters. In 1737, the gatehouse was demolished and a courthouse was built in its place. You can see the remains of the lock-ups in the castle bailey. The building currently houses a pub. In the 1800s, the Brooke family kept the castle as a ‘romantic ruin’, building new follies and creating a sunken Victorian garden. Today, what remains is a Grade I listed building and research into the castle’s history is ongoing. This summer (2015) there was an archaeological dig which uncovered, amongst other items, two skeletons. The age of these remains and whether they were buried within the castle chapel is part of an ongoing investigation. I’ll be interested to see what is revealed. Thank you for that link Tracey. It was very interesting to learn more about the background to the interpretation panels. Thanks for commenting Didi. I’m glad you enjoyed the post. Thank you Elizabeth for the info about Halton Castle. 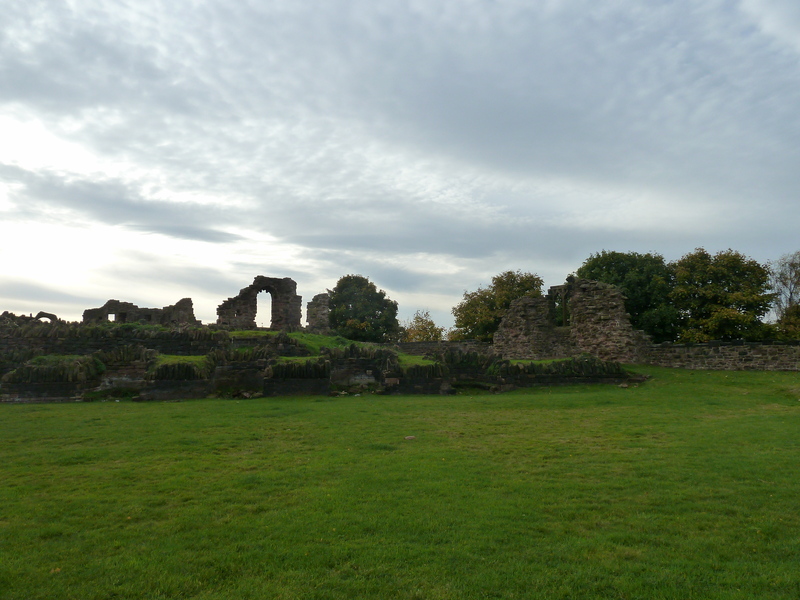 Previous Priory or Friary – Who Lies Where?